What does an IRONMAN eat after a triathlon? and a sweet Mexican pastry to go! When I write out these numbers I am like WOAH what an amazing feat. It gives me great honor and pleasure to have hosted two Ironman athletes the day after the 2011 Ford IRONMAN Cozumel race for a Cozumel Food Tour & a Cozumel Chef dining experience. Congratulations to all athletes and to the two athletes that joined me the day after, thank you. Cozumel is a fantastic location to host an Ironman with the 2011 race as Cozumel’s third. The turn out from athletes, families and the community was amazing. A little over 2,300 athletes from all over the world lined up to compete. At the end of the day, two American Pro-Men took first and second; Michael Lavato (finishing 8:23:52) & Patrick Evoe (finishing 8:30:36). However, to even finish the race regardless if you are a pro or not is quite an accomplishment. 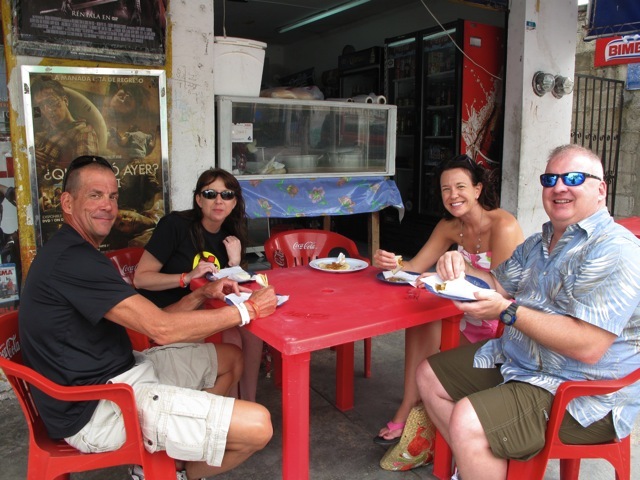 I had one athlete join me for a Cozumel Food Tour. In his original inquiry for a tour one question he asked me that made me smile was “will there be a lot of walking?” My response…”no, just a lot of eating!” Stiff and sore my guest athlete ate like a champ! He shared with me that this was his third Ironman he has competed in and that he finished the race at a personal best. Coming in one hour less than his last race he mentioned that his swimming split was the fastest he has ever swam. He complimented Cozumel on all its support to the athletes and noted how everyone cheers for everyone. The second athlete that I hosted was for a private dinner with his family and friends in a Costa del Sol Cozumel villa. It was a delight spending the evening and realizing what a commitment this race has on an athlete and his family. This Ironman has two young children that got to see their father compete in his first race ever and finishing. Sore bodies, but satisfied tummies I think these Ironmen had a wonderful time in Cozumel. We look forward to seeing you again at next years race and I hope to see you again personally! I would say they ate with the best in town.